Roll up your sleeves and get working! If you want to get rid of a rat problem, you can do the job yourself, for a low cost. I'm writing here to help you do it right. Rat control work is not easy. There is no simple fix. Please read the below instructions if you actually want to solve the rat issue permanently. Also, read my safety considerations below the instructions. It's not quick and easy - there is no effective rat repellent that'll do the trick. You can't just throw some rat poison in the attic, or lay out some snap traps or glue boards and think that'll get the job done. That would be like putting a band-aid on a toothache. You've got to address the root problem. You've got to stop the rats from getting inside your house in the first place. STEP 1: Find out how rats are getting inside the building. This is absolutely crucial! Those rats are entering your home and attic somehow. You will NEVER solve your rat problem unless you find ALL the entry points. Every single last one. One little failure, one missed spot, and you will have rats in your attic or house forever. You must inspect the whole structure, from the ground up, including all portions of the roof, and the plumbing system. Check vents, eaves, roof joints, plumbing stacks, AC chases, the chimney, EVERYTHING. You must be completely thorough. An intimate knowledge of rat behavior and building architecture helps a great deal. Know what signs to look for - brown staining and grease at entry points, gnawing, etc. Also, inspect in the attic, where you will see rat trails that will help you identify entry points, and you'll spot rat damage that you'll want to fix, such as gnawed wires or pipes. 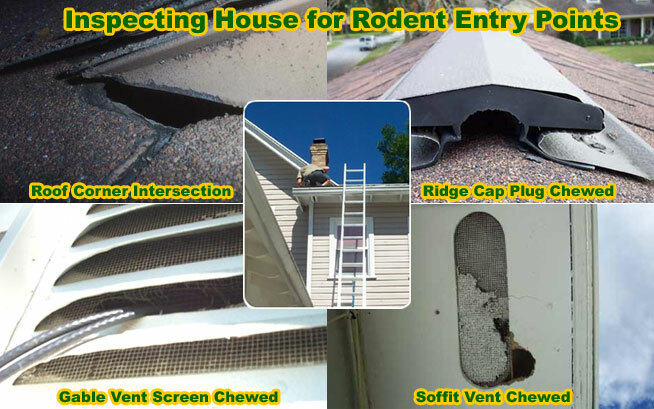 This page will help explain the inspection process in more detail: Rat Inspection. STEP 2: Seal up all the entry points. That's right, seal them up first, even if there are many rats currently inside the building. It's very important that you do it this way. If you leave the entry holes open, and then begin trapping or excluding the rats, guess what? Open holes mean more and more rats will keep coming in, and the job will never end. And here's another important point - the rats are much easier to trap once the exits have been sealed off. And if you intend to do an exclusion with a one-way rat door, then you have to seal all entry/exit holes first. Read more about repairs on this page: Rat Repairs. STEP 3: Trap and remove the rats. You have three options here. First, you can use the standard lethal snap traps. Second, you can use live cage traps. Third, you can install a one-way funnel door exit on the primary rat entry/exit hole, if you have identified it. I have used all of these methods. I do care about being humane to all wildlife, but when it comes to rats, which breed incredibly quickly and have a very short life span, and have good memories and gnawing abilities, I must say that I absolutely do use the lethal snap traps in the attic. I have found this method is to be the most effective, and it's more humane than a slow, painful death by poisoning. Set the traps on the rodent runways, not haphazardly. Trap placement is absolutely key. Bait doesn't even matter, but I do use peanut butter on my trap pans. Brand of trap does matter, and I like the old Victor wooden traps. 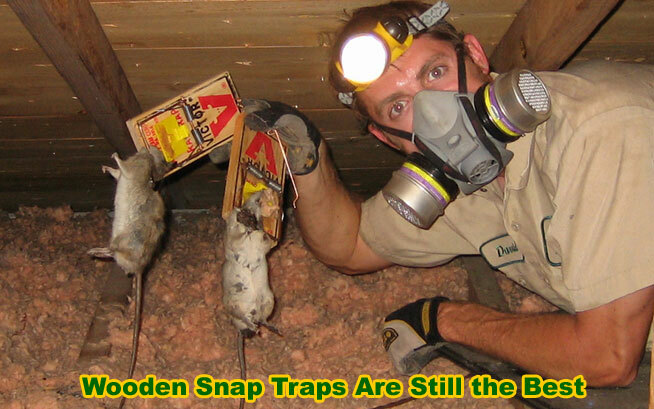 Check the traps frequently and remove and dispose of any trapped rats, to avoid odor problems. Read more about the art of rat trapping here: How To Trap Rats. STEP 4: Clean up after the rats. It's important that you decontaminate and deodorize the attic after you have removed the rats. Rats and rat feces can cause various health problems. Learn more about: Rat Diseases. Rats leave behind a strong pheromone scent which attracts new rats to the attic. This scent is in the urine and gland grease that rats leave behind. This scent encourages new rats to gnaw their way into your attic, so it's important to get rid of this scent. And other animals, such as snakes, track this scent too. I wear full biohazard gear and HEPA filter mask and vacuum up the droppings, replace soiled insulation, and fog the whole attic with a special enzyme-based cleaner that kills the germs, pathogens, mold, and scent of the poop and urine. Read more about the process: Rat Decontamination. Your inspection process must include ladder work and climbing on a roof. Most rats in attics enter via roof entry points - although they can get into the building a variety of ways. Proper ladder safety is a must, as is roof safety. I'm not going to go into detail about harnesses and chicken ladders and such, but be careful! Then, when in the attic, wear a respirator - you don't want to breathe in fiberglass insulation, dust or mold, or the variety of diseases associated with rats. Walk only on the wooden beams in the attic, never the sheet rock, or you could fall through the ceiling! Be careful, an attic is a hazardous place, where it can be easy to fall, or poke a roofing nail in your head. Also, be careful when setting snap traps. They are very strong, and can injure your fingers. If you're not experienced in setting them, you may have some problems, so be careful.